I’ve never tried rice pudding before. I’m 35 years old. Most people around here grew up on it. They eat a baked version. This was a quicker stove-top version. Turns out it’s delicious and satisfying! You should try it. There are lots of things you can add to make it more exciting, it’s nice served with warm peaches, I hear. You could also try eating this with baked pear or berries. Mine was served with chocolate sauce (1/3 cup sugar, 1/3 cup cocoa, 1/3 cup water – boiled) and banana, because that’s what we have laying about. Boil your rice (if you haven’t already) until it is mostly cooked through and water is absorbed. Add soymilk, vanilla and sugar. Simmer on a medium heat until milk has reduced and pudding is creamy. If you like, add a little more sugar or vanilla to taste. Also add spices or fruit, or whatever you wish. Serve warm with fruit, or just as is. 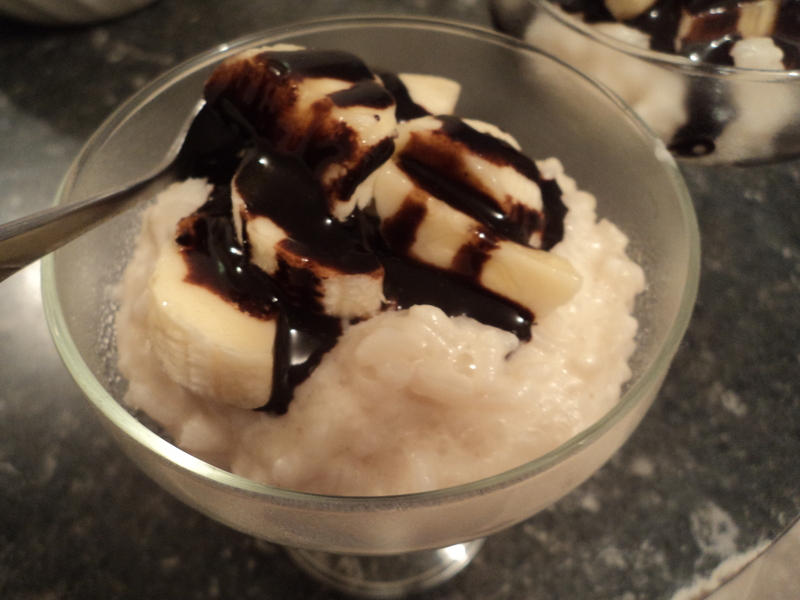 I made rice pudding recently – cooking the rice slowly in coconut cream and soy milk, for ages.